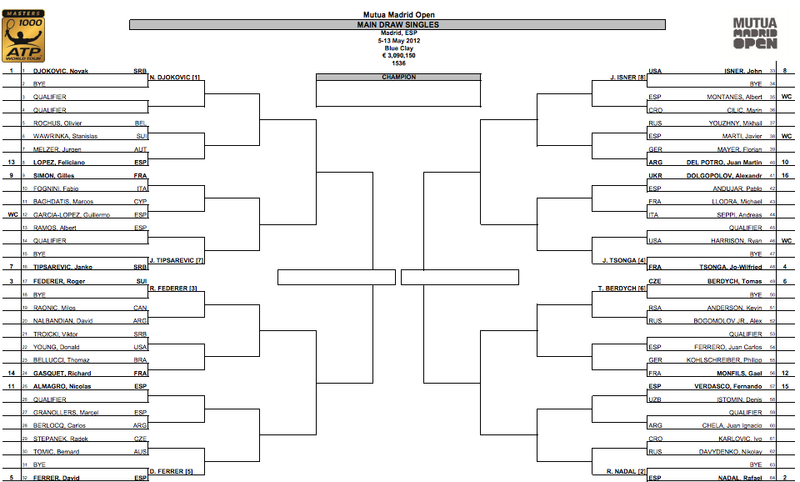 Madrid 2012: Draw and schedule. Roger Federer is in Madrid this week for the 2012 Mutua Madrid Open. The Swiss maestro will seek to win his fourth title of the year (Rotterdam, Dubai, Indian Wells) in hopes of continuing the reunion with old trophies; Rotterdam 2005, Dubai 2007, Indian Wells 2006 – all titles won again in 2012. The Swiss star receives a bye in the first round, and a difficult draw from his first match onward. He could face Milos Raonic or David Nalbandian in the second round, followed by Richard Gasquet or Thomaz Bellucci in the third round, and David Ferrer in the quarterfinals. Beyond that, seeding puts Federer in a semifinal clash with Novak Djokovic. If he gets passed that, Rafael Nadal is his seeded opponent in the final. View the full draw below. 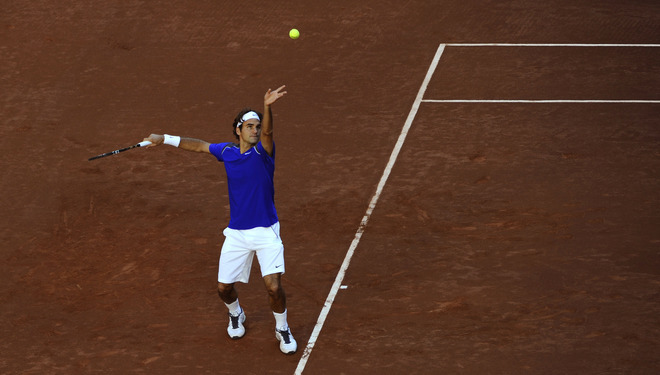 Play in Madrid takes place May 5-13 on blue clay, a first in tennis. Federer having a light practice, including a behind back (no look) flick of magic. Join the #1 Federer site. Show your support and check out the FedererFan07 Store. Connect on Facebook, Twitter, and Google+.